Ever dream of being an elite endurance athlete and competing in races like Hawaii's Ironman? Pro athletes are not the only people who can attain such superior accomplishments. Every season tens of thousands of amateur triathletes compete head-to-head, pushing their physical and mental strength to the limits. The Ironman competition is a true test: a 2.4-mile open-water swim followed by a 112-mile bike leg and a 26.2-mile marathon run. 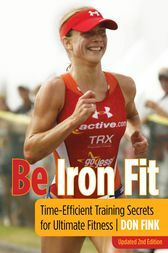 In Be Iron Fit, sought-after multisport coach Don Fink draws on his time-efficient training methods to provide a practical program in a step-by-step, enjoyable way—so even everyday athletes can attain ultimate conditioning. Don Fink is an internationally known triathlon and running coach, and a professional author. Through their business IronFit (IronFit.com), he and his wife, Melanie, have utilized their innovative training approaches to train hundreds of athletes on five continents to personal best times and breakthrough performances. Don is an elite athlete who has raced more than thirty Iron-distance triathlons and recorded many age-group victories and course records.